The 6th INTERNeX New Zealand PuB Night is coming!!! We decided to do our Pubnight on Thursday. And there is one big reason to join, because we will annouce the winner of our “Picture of the week” competition and hand over the prize. So if you haven’t sent a picture yet, you have two more days left to do it! This time we will go back to the roots and start our Pubnight again at the lovely Rakinos at 6:00 pm. Hope to welcome the new arrivals and of course all other members of the INTERNeX family. And certainly you are mostly welcome to bring your friends. Join us at the Pubnight and find out if you are the lucky winner of our competition! This entry was posted in INTERNeX, new zealand, PuB NiGHT and tagged competition, drinks, fun, INTERNeX, new zealand, picture of the week, prize, PuB NiGHT, rakinos, thursday on May 31, 2011 by ixcaroline. I would like to to introduce our new category “Picture of the week” to you. The topic this week is “You and your workexperience” in New Zealand. So take a picture of you while you are working and send it to pr@internexnewzealand.com and you can win tickets for the next Rugby game as Philipp did last week. Last day for enter the competition is Friday, 27th of May. So maybe you are the next one sitting in the stadium! 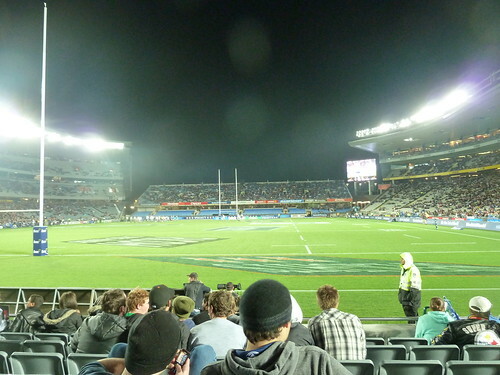 This entry was posted in INTERNeX, new zealand, Picture of the Week and tagged INTERNeX, new zealand, picture, picture of the week, rugby, stadium, winning, workexperience on May 26, 2011 by ixcaroline. Caro & Caro in Napier! Hey guys…hope you had an awesome weekend. I have! I spent the weekend with my friend Carolin from the INTERNeX hospitality program at Napier – a wonderful little Art Deco city! If you like architecture and wine you should definitely visit the Napier Region. 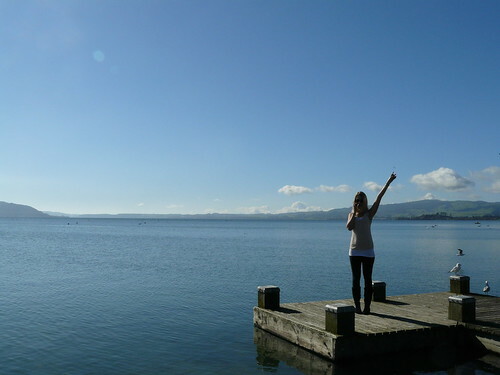 You need to know that three years ago Caro had spent four month in Napier as an exchange student. Arriving after a long bus ride at Napier we were picked up by Caro’s former guest parents, who offered us kindly to stay the weekend at their house. First I was a bit skeptical but in the end there was no reason for it, because Ita and Peter (the guest parents) are the best thing that can happen to you, if you´re an exchange student. Friendly, easy-going, helpful and taking care about you in a really enjoyable way. We had a nice long chat with Ita, who seems to never stop talking. 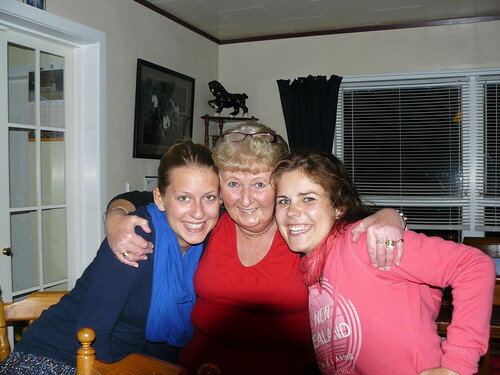 She told us about all her memories with Carolin and all the other students, she had. We also talked about the upcoming wedding of her youngest son and the “outfit-problem” of Ita. After a short stopover at Carolin’s old school we indulged in a delicious coffee from the award-winning café Cappadonna. Later I went on to the National Aquarium of New Zealand, where I met my first Kiwi and Tuatara, as well. It was really impressive to see these shy birds. We used the late afternoon for a little bit shopping and spent hours in a shoe shop! Thanks to Peter we had the chance to try the Napier nightlife. He dropped us off at a nice place at the harbour with several bars, but in the beginning it was really empty. It started to get crowded when a lot of marines entered the “Thirsty whale”. In the beginning of the evening we couldn’t imagine that the night would last until2 am! After a short visit at the market, on Saturday we made our way to the booked wine tour while still fighting with the effects of last night! 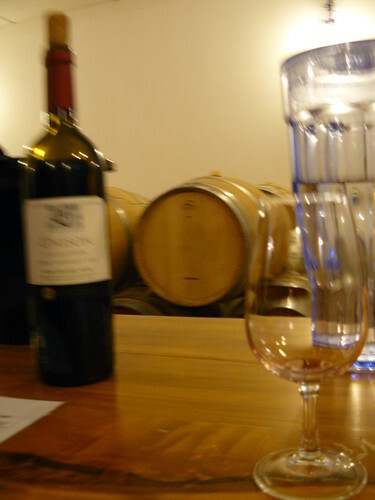 The wine tasting was really good and professional but we were a little bit disappointed about the small chocolate pieces we got to taste at the chocolate factory and the small cheese board in the end. 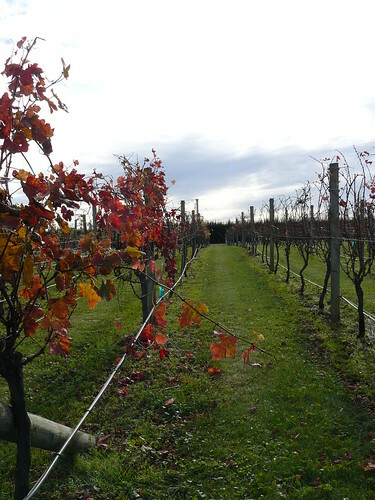 However the vineyards were so beautiful and it was no problem to drink the wine…;-) even if we still had a hangover. And cause we are always hungry we went on to “Brakers”, where Caro introduced me to the delicious Nachos with beef, been and baked with cheese. Exhausted but happy we had a little walk back to our lovely guest parents and spent the evening with good talks and a lot of laughing. So it became really hard to say goodbye on Sunday morning to these wonderful people who had been so great to us. But Ita offered me to come back any time and I really would like to see her again! 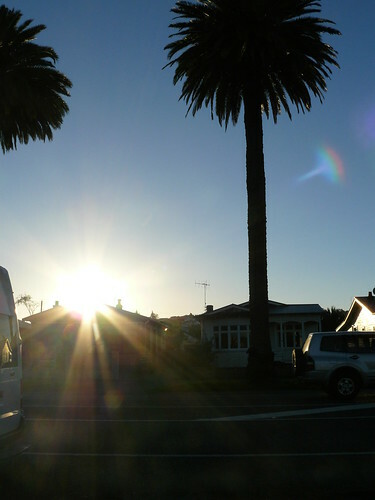 So guys if you have the chance, go to Napier – one of the places with a best weather guarantee in New Zealand. 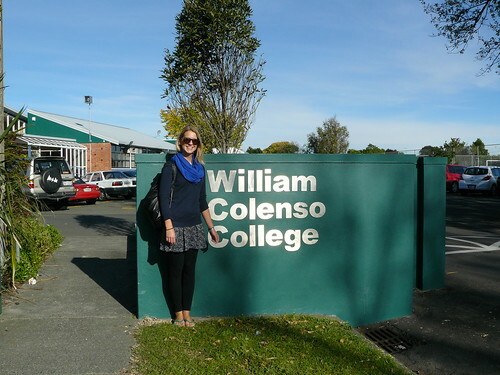 This entry was posted in INTERNeX, new zealand and tagged architecture, art deco, guestfamily, INTERNeX, kiwi bird, napier, new zealand, vineyards, willian colenso college, wine on May 24, 2011 by ixcaroline. Thanks to the Blues who are sponsoring our “Picture of the Week” competition, Philipp and I went to see the Blues vs Stormers. Unfortunately the Blues lost the game in the last minute but we had a nice entertaining evening. 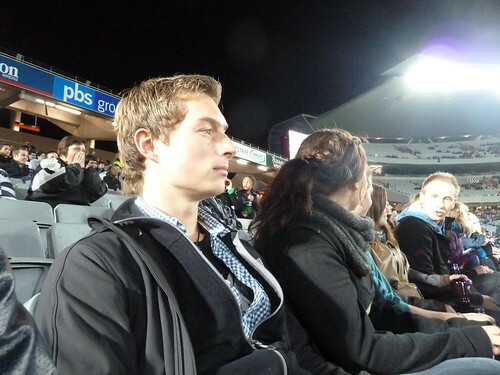 Together with a group of ten friends we went to see our first professional rugby game! If you are keen on winning Tickets for the next home game of the Blues send us your picture of the week and maybe you will be the next lucky winner! This entry was posted in INTERNeX, new zealand, Picture of the Week and tagged auckland, blues, enjoy, entertainment, friends, fun, great, INTERNeX, new zealand, rugby, winner on May 23, 2011 by ixpaul. Today we will launch our new weekly blog post: the picture of the week! Philipp, one of our INTERNeX participants, has sent us this awesome picture from on of our PuB Nights, where we met this group of lady officers! Do you also want to have the chance to win two free tickets for the next home game of the Blues? Just send a picture of your work experience in New Zealand to pr@internexnewzealand.com with a short description, and maybe your picture will be the winner of the next picture of the week! This entry was posted in INTERNeX, new zealand, Uncategorized and tagged auckland, cheers, friends, fun, INTERNeX, new zealand, picture, PuB NiGHT, rugby, tickets, winner on May 20, 2011 by ixpaul. Still don’t know what to do on a weekend in Auckland but you are keen to get out of your room? Tonight the Auckland Blues, the famous rugby team will play the Stormers. This will be a pretty cool game to watch because it’s the 2nd against the 3rd of the league. Checkout http://www.ticketmaster.co.nz/Blues-tickets/artist/1090488 for some last minute tickets. If you are lucky you will get cheap as tickets for only 15 bucks. Some of us will go there tonight so if you want to go in a group just give me a call 0220649084. I hope you will have a great weekend and maybe see you later at the game! This entry was posted in INTERNeX, new zealand and tagged auckland, blues, cool, game, great, rugby, tonight on May 20, 2011 by ixpaul.